This is an automatic Expert Advisor designed for scalping during the period of low market volatility. The EA uses an advanced algorithm to find the entry points, as well as several additional filters for entering and exiting the market. The Ea does not require optimization or any additional configuration. Does not use martingale, averaging, does not keep losing deals. 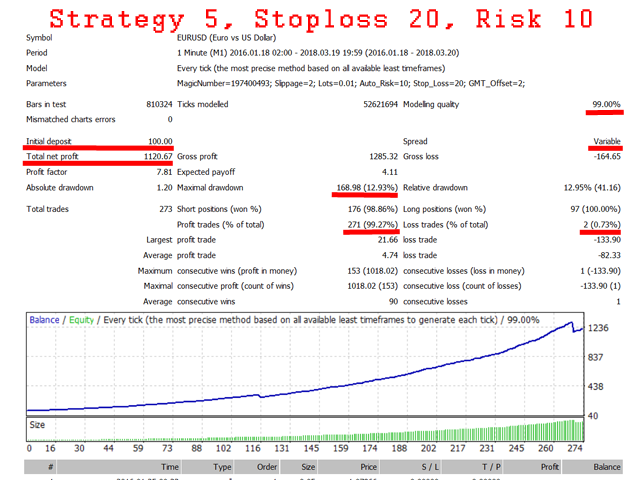 All orders are equipped with StopLoss and TakeProfit invisible to the broker. Does not require optimization and configuration. Uses ready-made strategies. Requires an ECN account with minimal spread (recommended brokers are listed in the Comments section and on the signal page). VPS with the minimum latency to the broker's server is required for trading. Testing should be performed with on tick data with 99.9% quality. Testing prior to 2016 is not recommended, the EA is adjusted to the current market. 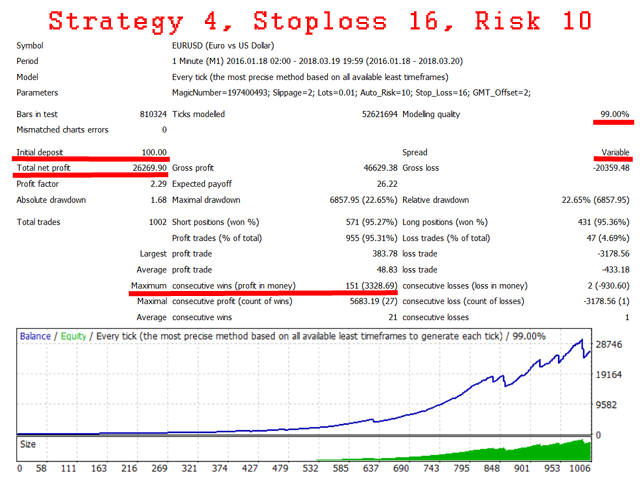 strategy_mode: select the strategy (StopLoss should be set manually for each strategy). MagicNumber: identifier of the EA. Fix lot: fixed lot (if Risk per trade: 0). Risk per trade: risk. 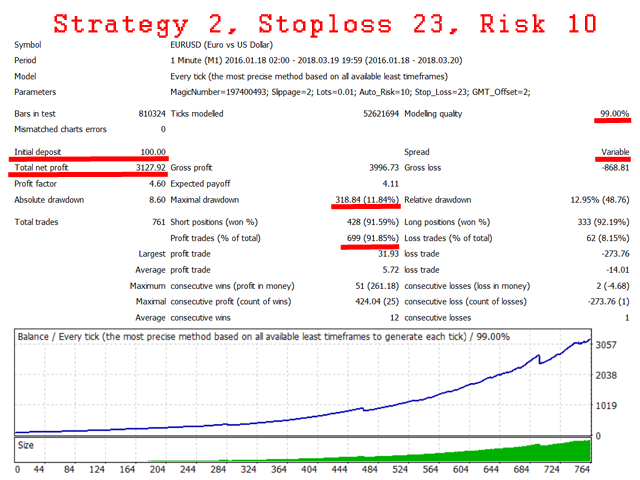 Lot size is calculated automatically based on the deposit size and possible loss by stop loss. For example: at a value of 5, closing a deal by stop loss loses 5% of the deposit. The lot size is displayed in the information panel. Max Spread - spread filter. It isn't recommended to increase this parameter. Opening of transactions in the conditions of expanded spread will lead to losses. TP - takeprofit. It isn't recommended to change this parameter in the big party. The adviser works in the period of weak volatility, increase can lead to the fact that the price won't reach the takeprofit. TP2 Minutes - the number of minutes to activated TP2 (0 = OFF). ATR TimeFrame - timeframe for ATR tracking. ATR_Level_max - max ATR level to open trade. Stop Loss: fixed StopLoss. Specified as for 4-digit quotes, automatically recalculated for 5-digit quotes. GMT Offset. Specify the summer time of your broker. 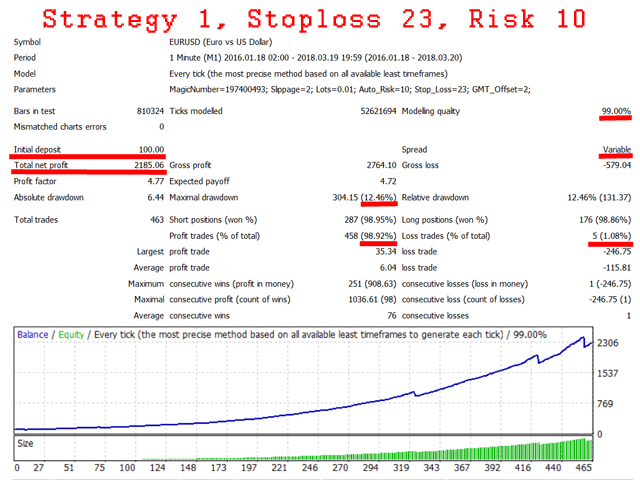 It is not recommended using a value of Risk per trade greater than 5%, especially for aggressive strategies. Please note that after hitting stop loss two times in a row at a risk of 10%, you will lose 20% of the deposit. Use brokers that are reliable and have shown decent results in trading with this Expert Advisor. The list can be found in the settings and in the description of the trading signal. Do not trade in a thin market in the second half of the December and the first half of January. The risk of losses in increased at this time. Don't use several strategy at the same time! It can lead to heavy losses! Remember that past profit does not guarantee future profit. Still Running good! I had one Stop Loss and the rest was nearly always positive. - You definetly need a Broker with Low Spreads and Low Commissions!! - You definetly need a Forex Rebate Service!! Советник работает на моём реальном счёте уже полгода, пока что я очень доволен. So far great results with this EA love this EA no losses yet in 2 weeks. Was ich bis jetzt sehe ist hervorragend. Ich werde meine Ergebnisse täglich teilen. After 4 weeks still stable results with small profits. Valeriy quickly answers your questions. Several days with the EA in real and all positive. Very fine and safe EA. Works great since July 1. The author is helpful and responds quickly. Max Spread - фильтр спреда, выше которого ордер не откроется. TP2 Minutes - количество минут после которых активируется TP2. TP2 - тейкпрофит по времени после открытия сделки. Добавлен фильтр MAX ATR, выше указанных значений сделка не откроется. ATR TimeFrame - таймфрейм для отслеживания ATR. ATR_Period - количество свечей, на которых измеряем ATR. ATR_Level_max - максимальное значение ATR на указанном периоде для открытия сделки.